In the 12th century Clement of Lanthony wrote a 'Harmony of the Gospels': a compilation of the four different gospel narratives into one. In the early 14th century, William of Nottingham, a Franciscan, wrote a lengthy commentary on Clement's work (this copy is now bound in two huge volumes). A colophon at the end of this manuscript records that it was written in 1381 for John Leyre, rector of the church of Great Doddington, Northamptonshire; he later moved to Olney, Buckinghamshire; and the manuscript was later given to the Benedictine abbey at Evesham. 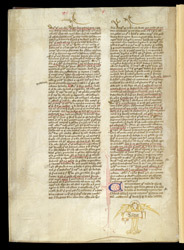 The calligraphic ascenders, tinted with yellow, which extend into the upper margin of this page suggest that the scribe may also have been responsible for the fine yellow-tinted drawing of an angel holding the catchword in the lower margin.